Ornate and gilt...and perfectly French. Beautiful weathered patina. This frame fora mirror hails from the 19th Century. Piece does not currently have mirror in it, but can be added upon request. Inside dimension is 9.75" at widest point and 17.5" high. The most charming set of four century garden chairs from 1880 discovered in the markets of Paris. Antique French clock from the 1900s. Painted metal face with wood backing. A battery system has been added to clock, so that it is operable. 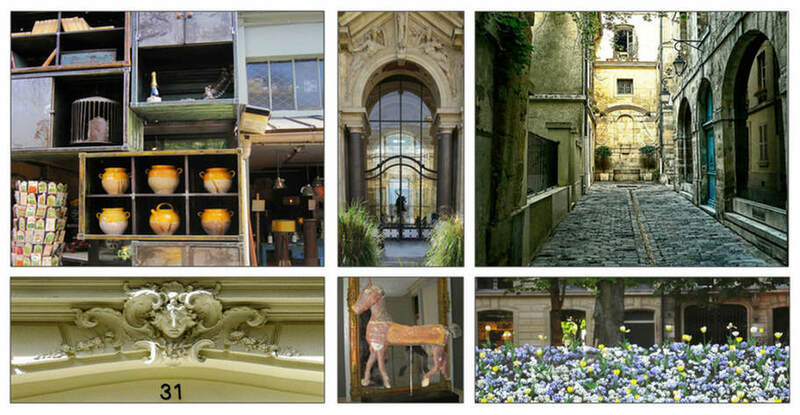 Lovely way to bring the history and soul of Paris to your home. Amazing serving tray from France, 19c. This metal tray is in a black finish with vibrantly colored floral detailing. Amazing serving tray from France, 19c. This metal tray is in a black finish with gold filigree detailing, and a beautiful painted landscape in the middle. Very rare, limited edition military iron Campaign Daybed. This 19c. daybed was made as a promotion for the factory in the 10th arrondissement in Paris, Henry Aine. It is very unique due to its much larger size for a military bed. The daybed has a stamped plaque, leather seat with woven supports, and rope detail. Truly magnificent piece. Dimensions: 104ʺW × 32ʺD × 30.5ʺH; seat height 15"
A beautiful Napoleon III painted and gilded chauffeuse (slipper chair) from France c 1870. Newly upholstered in a natural colored linen with nailhead accents. 35"H x 21"W x 25"D; seat height is 17"; seat depth is 18". For the Francophile that is looking to bring the charm and soul of a Parisian garden to their own home. White metal folding table from 1880, in a white painted finish. Place this soulful piece in your garden and you'll be instantly transported to France, 1880. The gorgeous ornately scrolled base and the irreproducible finish of this table is what makes it exceptional and truly unique. Antique French Bistro Table from 1930. Oak top, beautifully detailed cast iron base. Grand iron table that once lived in a Tannery workshop as their work table. This 1910 piece has 8 drawers total: 4 wood ones on one side once used for the Tanner’s patterns, and 4 metal drawers on the other side for his tools. Large shelf below for storage. This antique piece would make for an excellent kitchen island or work table. Gilt x-base iron table that hails from France, 1970. The top is covered in a beautiful stone grey original leather with gilt detailing. Pristine vintage condition. Would make for a gorgeous desk. Please note: this item is currently on our container coming from France to the US. Expected to ship within US in February 2018. Contact with any questions. The most charming antique cafe table discovered in the Paris Puces. Beautiful grey stone top, brass edge, and cast iron base. Antique French Bistro Table from the 1900s. Painted wood top, beautifully detailed iron base. Antique French table from the 19th century. Beautiful painted French gray finish, ornately carved wood, and great height of 39.5". This gorgeously shaped piece is the perfect foyer table. The sweetest little French writing desk we've ever seen. Beautiful antiqued painted finish with floral detail and gilt edges. Three drawers with brass pulls. Would be a splendid vanity. The most charming 1910 garden furniture discovered in the gardens of a shop in the Paris Puces. This table is very unique in that it has a contrasting white top with black iron base. Classically designed, this antique table from France, circa 1880 features a turned leg wood base in a black painted finish and a marble top with great soul. The dimension from the floor to the bottom of the crossboard of the table is 22.75”. Impeccable bar that hails from a cafe' in Montmartre, Paris 1910. Zinc top, oak base, beautifully carved details. On the service side is one drawer, storage below, two basins, and grooved counter space. Mix yourself up a French 75 and enjoy! French Drapier Boutique Island, 19c. Exquisite carved wood casegood, once used as counter in a drapier’s (clothier’s) shop. France, mid 19th century. Two operable doors on the front side of the piece; back is open with a base shelf. The corners of the countertop are square on the front edge, and rounded on the back. This was for a specific purpose: the square edges signify that the customer does not cross that point, and the rounded edge lend to ease of motion for the drapier. Pristine antique condition. This piece would make for the perfect kitchen island. A stately Napoleon III wine cabinet, circa 1870. This unique, solid wood cabinet has three operable drawers and three cabinet doors with beveled glass insets. The original black painted finish is beautifully worn, lending to the character and history of the piece. Take note of the exquisite hand-carved detailing. A remarkable element are the shelves below, the majority are devoted to a different wine region in France with original inscriptions like Provence and Bordeaux. This beautiful 19th-century French bookcase features carved wood in a painted French blue and white finish, two shelves, and one operable door with a unique metal pull. The carved dentil work, as well as the carved flora detail surrounding the central quatrefoil design element, make this antique quite interesting and unique. Exquisite wood casegood, once used as work counter in a drapier’s (clothier’s) shop. France, 19th century. Five operable drawers, with storage space below on the right (shelf 9.5 above floor). Take note of beautifully detailed metal drawer pulls. Wonderful antique condition. Exquisite wood table, once used as display counter in a drapier’s (clothier’s) shop. France, 1820. Impressively sized with a beautiful, gently worn finish. Intricate carved detail of a lion's paw at the base of the two front legs. Small drawer on right side of piece. Lower shelf is 6.25" from the floor. An antique trunk like this one we discovered in the markets of Paris will no doubt bring soul and history to any interior. Brass corners and studs provide an excellent finishing touch. Very good antique condition - some wear consistent with age and use. Fabric removed from inside trunk and painted to make a smooth finish. Italian sparkling round chandelier from 1960. with five tiers of triede Murano glass prisms, suspended from a metal frame. Price includes fixture to be rewired for US use, if desired (please all 7 business days). This stunning fixture is in excellent antique condition. A pretty little venetian glass chandelier, from Murano, circa 1940. The intricately turned body and arms make this piece truly sparkle. An interesting and unique detail of this chandelier is the mercury glass escutcheon and bottom. The fixture has 3 lights that have been rewired for U.S. use. A beautiful 4-arm chandelier, circa 1940, made of Murano glass with brass and mirror accents. It was discovered in the markets of Paris. The chandelier has been rewired for U.S. use and is in working condition. The Ventana 3-tier chandelier features ebony finished wood with antique brass finished accents or polished nickel finished accents. Natural linen fabric shades with rolled edge hem. Antique bed from France, late 19th century. In the style of Louis XVI. Upholstered headboard with intricately carved wood frame. Carved wood footboard & side rails. Newly upholstered in a natural colored muslin, with double welting. Front & back of headboard & footboard are both upholstered. Painted finish on the fame is gently worn to reveal the warm tones of the wood, as well as the items' age & beauty. The greatest little vintage daybed/crib, found in the markets of Paris, that could be used in so many ways. As the side folds down....you can add your favorite cushion and it would be the perfect outdoor bench! Or, use this piece to showcase your potted plants as a jardiniere. The seat/platform is 10"high. Feel like French royalty with this antique bed canopy in your boudoir! We discovered this 1920 piece in the markets of Paris. What makes it particularly unique is that ornate gold trim is actually metal. We have newly upholstered the canopy in a muslin, as a base for the buyer to upholster in their own fabric. The best vintage French daybed, discovered in the markets of Paris. Because it folds up and rolls, it would be the perfect piece to provide additional seating in a backyard or a place to lounge near the pool. Seat height is 14". Inside dimensions are 31"x 71". Late 19th century French painted wood headboard, footboard, and side rails. In the very fine Directoir / Louis XVI style. The piece is exquisitely hand carved, and the off white painted finish is beautifully worn with age, revealing warm wood tones throughout. A must for a French boudoir. Paris at its finest….a beautiful ornate mirror from 1880. It has a exquisite painted finish with glimmers of gilt. Hand carved scroll and filigree detail, with cherubs throughout. Impeccable antique condition. Three tiered Jardiniere from France, 1920. The perfectly Parisian way to display plants in your garden or patio. A stunning French late 19th century three-panel intricately hand carved gilt screen. Each panel measures 24" wide, and has a scrolled base with a carved acanthus leaves, among egg and dart bordered panels. The beaded design continues at each side and at the top of each panel is a ornately carved shield motif with ribbon and fruit accents. Take note of mask like faces at each corner of the panel - truly adding mystery to this piece! This two sided screen has been newly upholstered in a simple white muslin. The original gilt finish remains with beautiful notes of red undertones shining through. Dimensions: 72" long, 68.5" high, 2" deep, 6.5" deep at feet.